If you like dessert flavors, the SAP line by Gepetto is a must try! Freshly baked biscotti smothered with a slightly sweet apricot preserve. Sap V3 takes your coffee dunker to another level! If you like dessert flavors, the SAP line by Gepetto is a must try! I really dig the branding on the entire SAP line of e-liquids. They did a great job and keeping everything simple and professional. The white label really makes the gold logo and black font pop. I know what you’re thinking, anyone can design a nice e-juice label; unfortunately, not everyone does, so I’m giving credit where credit is due! A sweet and delicate apricot biscotti. The aromas coming from this bottle scream biscotti; you know, the hard-ish cookies you dip in your coffee when you’re treating yourself? There’s a hint of sweetened apricot in the foreground as well. A set of 3mm dual core claptons on the deck of the BTFC RDA by Augvape. Pulsed on the Titan V2 by Silver Steam Vapor. I decided to keep the airflow 75% open for the majority of this review, but did shut it down to 50% towards the end. Front – I thought I’d get hit with that classic coffee cookie flavor first, but to my surprise, the apricot took the front line. Mixed into the slightly tart apricot was a sweet buttery biscotti that created a chewy mouthfeel. As for the sugar here? Super low — almost non-existent, actually. 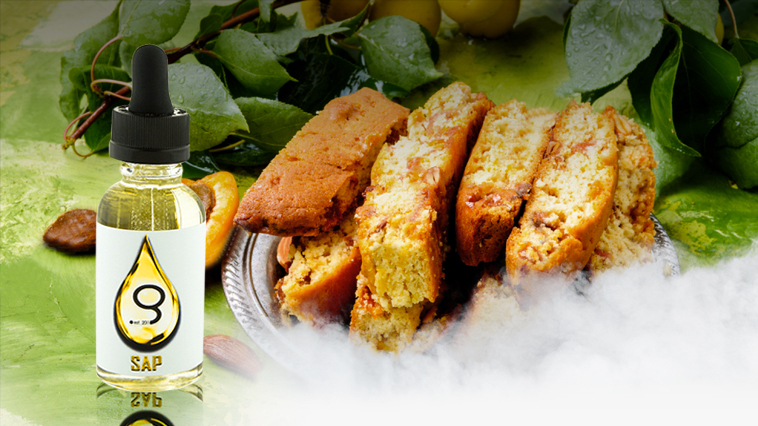 Middle – As I continued to vape, Sap V3 started to show a more ‘adult’ like flavor spectrum. The biscotti was a bit more upfront, and even had hints of a raw or under-baked cookie dough. I’d compare the apricot flavor to a jar of good homemade apricot preserves; there are definitely hints of fresh fruit, and no more sugar added then absolutely necessary. End – More of the same towards the end of the vape. That nice bakery cookie flavors fades a bit, and is replaced by an apricot and cream duo with a touch of raw dough on the finish. The sugar level remains extremely low. Aftertaste – My palate was left clean as a whistle. All three of the SAP eliquids by Gepetto had a perfect aftertaste. For a 70/30 blend, the cloud production was actually not too bad on my setup. Larger claptons tend to perform well when it comes to the vapor! To be honest, V3 is probably my favorite flavor from Gepetto. I really wish all dessert liquids were this clean. I never had to worry about changing my cotton mid vape, nor did I have to give my coils a warm water rinse cycle to remove the sugar gunk after. Because the sugar content was so low, I could definitely vape this flavor all day long. It’s getting harder and harder to find e-juice flavors like that now-a-days. Previous articleIs CBD Legal in All 50 States?